The Silo, a highly popular Lewiston restaurant, has won several local awards plus a major debut as a feature stop on Travel Channel’s Man V. Food. While the food, awards, and architecture of The Silo are all points of extreme interest and notoriety, perhaps the most interesting to us is the history! In the 1930s Lewiston was known as Hojack Country and served as one of the central meeting points for the famous Great Gorge Railway, the silo itself holding that oh-so-precious coal that fueled the many steamers that passed through. Due to the railroad popularity, the surrounding area morphed into a busy market and town activity spot, with tons of docks for maritime market. Today, The Silo is located on Water Street in the heart of Lewiston, still a locally-loved eatery that serves famed steak subs and hot dogs out of their iconic old coal silo, as well as old-fashioned ice cream from an attached historic caboose. 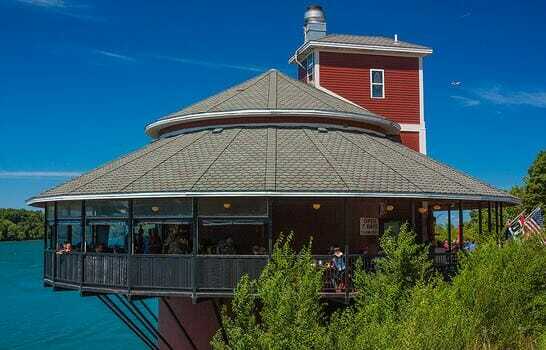 Enjoy an amazing view overlooking the Niagara River from the Caboose, and some seriously delicious and unique food inside the Silo. It’s easy to see why this eatery has earned the People’s Choice for Taste of Lewiston for two years, as well as the Architectural Wonder award by Buffalo News, and even Man V. Food Adam Richmond’s very own personal notoriety in 2010. The food is amazing, ranging from the famous Silo Dixie Dog, complete with coleslaw, BBQ sauce, bacon, and french fries, to the Old English Fish n' Chips or Smelt Basket. Try the famous Haystack while here if you have room, as seen on Man V. Food, and enjoy the unique combination of rib-eye, mozzarella, and hash browns all served smothered with mayo on a hoagie! This place isn’t kidding around when it comes to great food, great history, and great views!